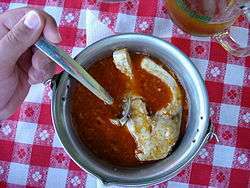 This article is about the hot paprika based fish soup prepared in the Pannonian region. For other fish soups, see List of soups. Fisherman's soup or halászlé (Hungarian pronunciation: [ˈhɒlaːsleː]) is a hot, spicy paprika-based river fish soup, originating as a dish of Hungarian cuisine, a bright-red hot soup prepared with generous amounts of hot paprika and carp or mixed river fish, characteristic for the cuisines of the Pannonian Plain, particularly prepared in the Danube and Tisza river regions. With its generous use of hot paprika, halászlé is arguably one of the hottest (spicy hot) dishes native to the European continent. The dish is a famous soup, and often consumed by tourists and locals. An important ingredient in Fisherman's Soup is in the court bouillon, which adds significant flavor. To prepare the soup base, fish trimmings are used, fresh carp heads, bones, skin and fins. These are boiled with water, salt and vegetables (red onions, green peppers and tomatoes) for two hours. When ready, the court bouillon is strained. Hot ground paprika and two finger-thick carp fillets, the roe and coral is added, ten minutes before serving, to the boiling soup. Fisherman's Soup a la Szeged. Four different kinds of fish are used. The usual ratio is 1.5 pound (800 g) carp, 1 pound (500 g) catfish, 0.5 pound (350 g) sturgeon and 0.5 pound (350 g) pike or perch. Fisherman's Soup a la Paks. Homemade thin-cut soup pasta called csipetke is added. Fisherman's Soup a la Baja. According to traditional recipes 6.5 pound (3 kg) fish is added and approximately 75% is carp. It's served with homemade thick-cut soup pasta called gyufatészta. Traditionally, the soup is prepared in small kettles on open fire on the river banks by fishermen. Fisherman's soup in kettle is prepared with fresh fish on the place. When prepared in kettles, first, chopped onion is fried in the kettle with some oil until it is caramelized. Then, ground paprika is added and the kettle is filled with water. When the water comes to a boil, other spices (such as black pepper, white wine, tomato juice) are added, and finally the fish, chopped into large pieces. Entire fish, including heads and tails, are often added to the soup. The soup is usually prepared with mixed fish, the most common species are common carp, catfish, perch and pike. Depending on the amount of added hot paprika the soup is mildly to very hot. The Hungarian soup is famous for being very hot and spicy. The soup is served directly from the kettle and eaten with bread (the spicier the soup, the more bread is required). Many people, especially fishermen, regard the preparation of fish soup as somewhat secretive. Although the recipe is basically simple, the "right" ratio of spices, onion, fish (its quality and variety) and water, as well as timing, affect the soup taste significantly. Many dedicated fishermen regarded their recipe as a highly-kept secret. Competitions in preparing the soup are popular and are usually held at fairs along river coast. Visitors are offered to taste the soup for money or for free; the quality is determined by public or committee and (un)success of competitors is often subject of mutual teasing. The soup is best accompanied by dry white wine (such as Riesling), which may be diluted with soda water. The combination of wine and soda water (a wine spritzer) is called fröccs in Hungarian. The Fisherman's soup or halászlé is a traditional dish for Christmas Eve dinner in Hungary. Look up Halászlé in Wiktionary, the free dictionary.